Discussion in 'Grappling Technique' started by matador1872, Mar 21, 2008. I'll watch that. Thanks for the link. Some of the ugliest people ever to caught on video. As I've said/complained elsewhere, it seems that my losses are always videotaped, but the videographers are nowhere to be found when I'm winning! i watched 1 minute so far and its so true. jiu jitsu becomes a lifestyle! Anybody else having problems watching the whole video? Seems to stop playing after the first ten minutes. I'm having that problem. I'm DL'in it now. Hopefully that will help. It takes a long time to load. I paused it and came back an two hours later and was able to watch the whole thing just fine. You can find it on youtube in 3 parts if you have trouble watching it. Just search jiu jitsu lifestyle. Cool, kinda slow, but cool. 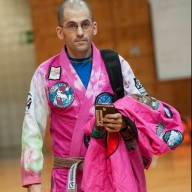 Looking forward to seeing the YJJ compadres do well @ Pan Ams. Brendan's seoi nage in the finals last year was sweet!